Hello, welcome to Start Em Up Stables! 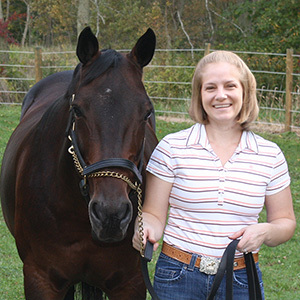 My name is Rhonda Pickell, and I’ve been training horses of most disciplines and breeds for more than 10 years specializing in off the track Thoroughbreds and young horses with little to no training. My adventure with horses started long before that. As with most little girls, I was infatuated with horses at a young age and joined 4-H. Soon after, we brought home our first POA pony followed by a second. My infatuation was transformed into respect of the horse’s ability and versatility. I studied at Meredith Manor International Equestrian College in Parkersburg, West Virginia where I gained the knowledge and tools necessary to mold and nurture any horse to achieve their full potential. During my time there, I was able to ride and train many different breeds of horses in multiple disciplines, including dressage, jumping, and western riding. I graduated with the titles of Riding Master VI and Certified Riding Instructor Level Two. 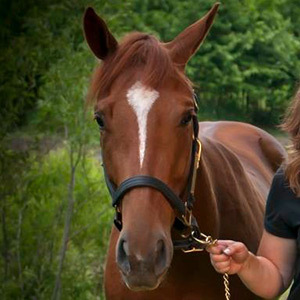 After graduation, my first job was as a groom for a Saddlebred show barn, Fay Baynton Stable. 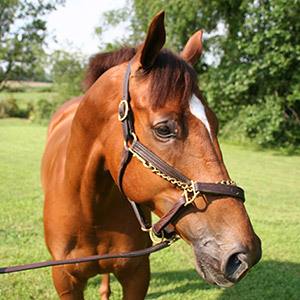 I moved on to Green Gate Farm as the barn manager and had the opportunity to work with off the track thoroughbreds. I fell in love instantly with the breeds personality and intelligence. When new rescues arrived, I assisted in developing an appropriate diet and turn out schedule. Also, depending on the horse’s previous work schedule: recently raced, had been resting, or recovering, I would develop an exercise schedule. While riding and working with each horse, I began to realize that the horses were effortlessly learning new exercises, and this gave me the perspective to see each horse moving into a new career with a new home. I decided to transition into veterinary services, with the hopes of expanding my knowledge base to provide every opportunity for a horse to succeed. I began working for Crum Equine Veterinary Service, an all ambulatory practice based in Lancaster that traveled to farms throughout Ohio. As the Lead Veterinary Assistant, I had hands on experience assisting the doctors while they were diagnosing and caring for horses of all breeds and disciplines. Among the many situations I encountered working in the field were: learning to properly administer medication, triage lacerations, and recognizing the symptoms and treating of ailments such as lameness and colic. I was then promoted to Inventory Specialist as well as assisting the Office Administrator with daily duties. I learned the intricacies of running a business, while developing relationships with both the clients and the medical providers. The care of each individual horse is vital in creating the building blocks for a successful future weather it is your new off the track Thoroughbred or your young horse. Here at Start Em Up Stables all of the necessary steps are taken to ensure your horse has a foundation to elevate them to their full potential. Let’s start your horse out on the right hoof! Off the track Thoroughbred. A dog in horse clothing! Always came when you called him and always ready to work. Loved trot cavaletti and excelled in dressage. Last update living in Ostrander, Oh showing in Training Level Dressage. Untrained 4 yr old Draft Cross: Just like sitting on a couch! Her favorite part of training was the grooming. Clipping, mane pulling, you name it she loved it and would stand for hours. Biggest accomplishment; overcoming her fear of having her nose touched. Excelled in trail. Last update living in Pennsylvania trail riding. Off the track Thoroughbred. Laziest 4 yr old TB I’ve ever met! Due to his many growth spurts, Armani’s biggest accomplishment thus far is cantering. Armani has graduated the 90 day program and is currently still in training at Start Em Up Stables for Training Level dressage and jumping. Resident training guru. Shame is an intricate part of the training program. Horses are herd animals and are able to learn from example. Her calmness and dependability enable young and inexperienced horses to learn from her example and build confidence in tasks like trailer loading and trail work. Training at Start Em Up Stables is done with natural horsemanship. I believe in a non aggressive training approach that allows you and the horse to gain mutual respect and understanding. An emphasis is placed on moving from hand, body, leg and rein pressure. Each horse is signed on for an initial 90 day training session. 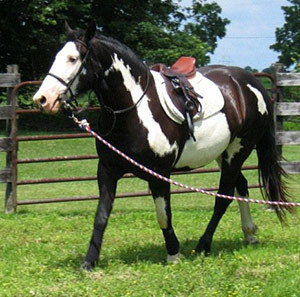 In this time your horse will be taught to lead, lunge, tie, walk, trot, and canter. The first two weeks consist of intensive ground work: leading, lunging, and tying. We want to make sure that the horses are very easily handled for the caretakers and their owners. Also during the first two weeks your horse will set its learning pace and a training schedule will be developed appropriately. As your horse progresses bridle and surcingal are introduced. While lunging side reins will be added to enable your horse to become comfortable with rein pressure on their own before being ridden. As these exercises are coming together mounting and riding are introduced. Progression depends on each individual horse. All exercises are done at your horse’s optimal pace to gain the confidence needed to excel. Your horse will be exposed to lower level dressage, cavaletti, trail riding and many other exercises that will encourage your horse to become a well rounded riding companion. © Copyright 2019. Start Em Up Stables. All Rights Reserved. Crafted by demo38.